You are here: Home / Chapter 7 Bankruptcy / Are You Still Worried About Filing Bankruptcy? 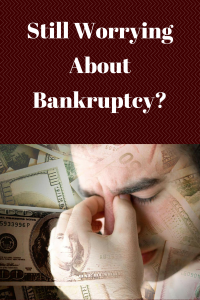 Are You Still Worried About Filing Bankruptcy? Are you still one of the many people who have this notion that filing for bankruptcy will bring the end of the world for you? Do you consider it a total failure? Are you afraid that friends, family and co-workers will find out about your filing? Are you worried about being able to buy a house in the future? Are you worried about being able to finance a vehicle? Are you thinking that your credit score is more important than your current financial situation? Are you just plain scared to make a move? These and other questions are ones that I hear dozens of times a day in my practice as a bankruptcy lawyer. And I love getting the opportunity to refute some of the misconceptions that are floating about and to help people focus on the task at hand with regard to their financial life. It’s good to know that bankruptcy will not bring the end of the world. I have yet to speak with a past client who regretted the decision to get out of debt. In fact, a good percentage of clients have told me that they wish they would have filed sooner. They threw a lot of their hard-earned retirement money on occasion towards credit card debt. They struggled with bill collectors, civil lawsuits, wage deduction notices, auto repossessions and non-stop harassment from automated collection calls before they decided to take action. If you are someone who is exploring the idea of filing bankruptcy and you just can’t get off of the starting point, examine your life without filing. If you do not file for bankruptcy and you do not receive debt relief, where will your situation likely lead? Will you be able to pay off your debt without any court intervention? Will your debt likely increase or decrease over the next six months to two years? Where will your credit score be in the next six months since that is so important to most people? Where will your mental state of mind be in the next six months if you don’t take action? These are the questions that I redirect potential clients to whenever they are hesitant or indecisive about getting out of debt. The truth is that things will get better with the help of a bankruptcy. The huge weight of debt will be lifted off of your shoulders. All of the collection efforts will cease. Not only will you have financial freedom, but you will have some mental freedom as well as you are no longer being harassed by debt collectors. I know that many people don’t talk about their bankruptcy experience to family, friends and co-workers. I know it’s hard to get information from a former filer. I know it’s tough to even make the phone call to a bankruptcy professional to learn your rights. But there is something that you can do and I recommend it strongly. You can search the Internet and find true stories and accounts from those who have filed before you. I think that what you will find will surprise you. You’ll find that people do better after a bankruptcy. You’ll find that life got better. You will find that people purchased houses within six months to two years after filing. You will find that people financed vehicles and leased vehicles immediately after filing. You will find most either got credit cards again or were at least offered the opportunity for a credit card. You will find that many people were finally able to save for their retirement. In fact, you will find a plethora of stories that will absolutely change your perspective on what it means to file and most importantly, what happens to someone after they file. There are times when you can handle your debt and manage it and work payment plans to satisfy your creditors. There are other times when the debt is so insurmountable that only a bankruptcy will alleviate the situation. Each case is different. Each person’s acceptance of the situation is different. But keep this in mind: there is a reason why the bankruptcy laws are federal. There is a reason why every individual in the United States has the opportunity to utilize the bankruptcy laws to their advantage. The reason is that filing is necessary for many Americans who have debt that is out of control. You don’t have to be ashamed to file bankruptcy. In fact, it very well may be the wisest financial decision you ever make.